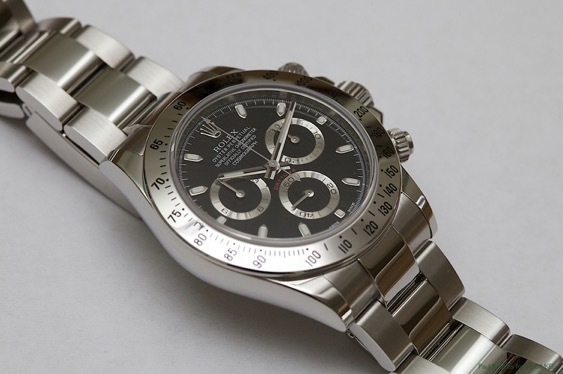 If we ask an experienced watch collector to get rid of all his watches and pick one single watch for life, we will most probably be responded with “ ROLEX Daytona “ no matter how valuable and complicated his watches were. Why..? Because Daytona is a legendary design of an world known, iconic luxury watch maker company and it's been continuously evolving for almost 50 years. Housing a very robust and easy to operate chronograph caliber, Daytona is designed to out come every possible harsh condition in a daily routine. It's virtually indestructible “Oyster” case makes it a watch that can be enjoyed through generations.It is also a very cool looking and versatile watch which can match practically every kind of style. Another thing about Daytona to note; it is hard to get and pretty easy to sell. Though it's been almost 25 years after the introduction of the first automatic Daytona, it is still not that easy to get one. Some dealers talk about delivery dates up to a year later and some says it can be yours instantly if you are ready to pay more than the MSRP. Of course time is changed now and the availability is improved with the possibility of a reduced pricing depending on the occasion. The very first watches with Ref. 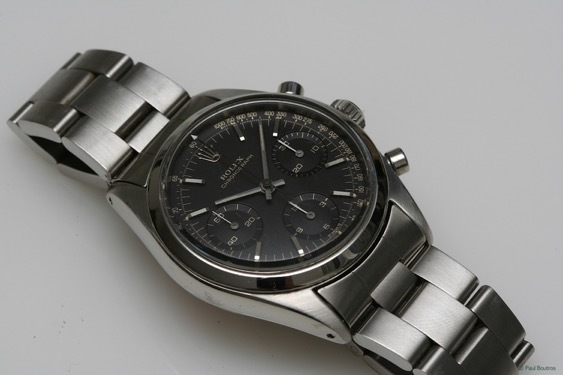 : 6239 launched at 1963 sported the word “ Cosmograph “ on the dial. The chronograph watches which are in production since 1939 got a more sporty look thanks to the contrasting color dials. The seconds important revision was the removal of the tachymetric scale from the outer edge of the dial. The bezel itself became the tachymetric scale. 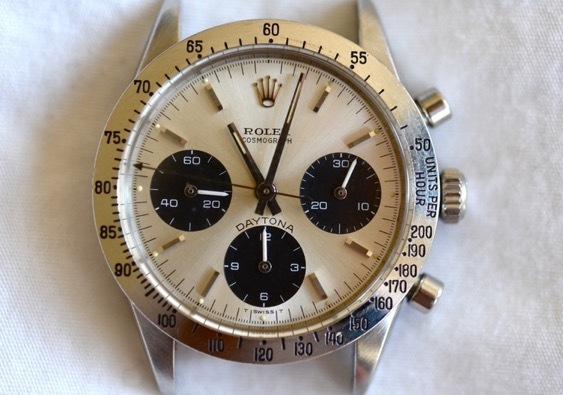 A year after in 1964, “ Daytona “ writing added to the dial design. 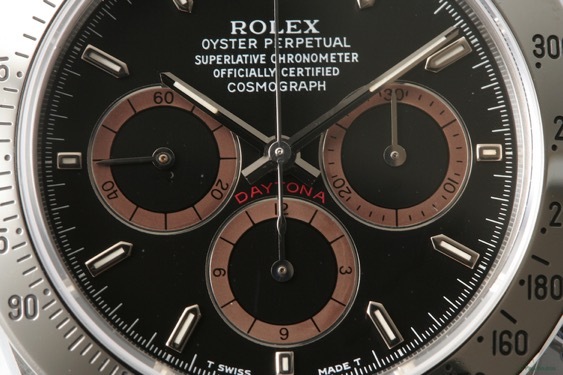 This was a tribute to the 24h Daytona race at Daytona Beach – Florida which had Rolex as one of it's sponsors. 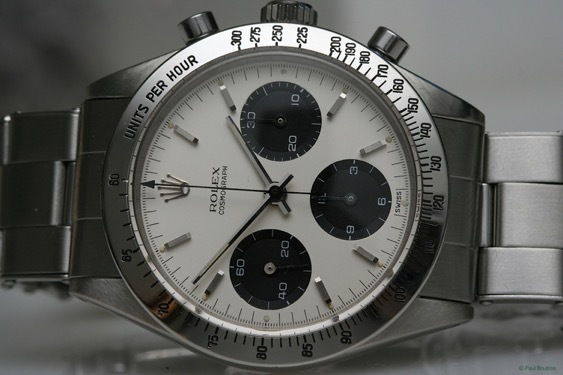 In 1967, the Daytona word moved to the top of the sub dial located at 6 o'clock position. This lay out design is still present at the up to date Daytona models. Another major upgrade took place in 1965. 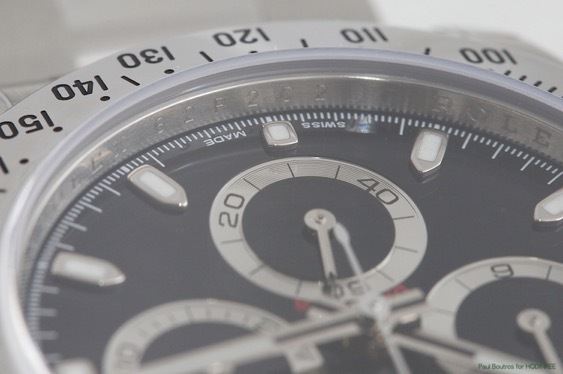 The chronograph pushers were modified with screw-in locks for greater WR rate. 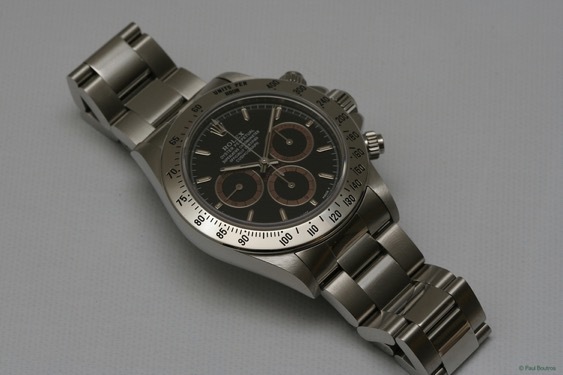 Daytona faced no more major revisions until 1987. 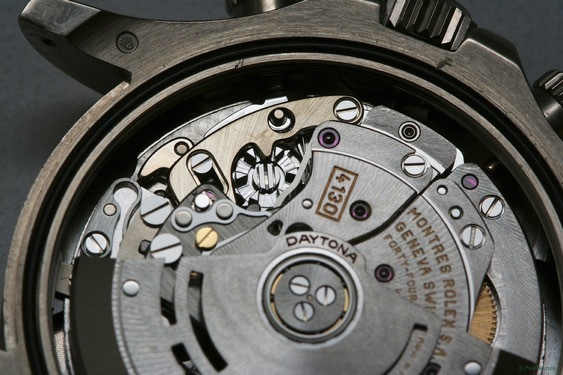 During that period, Daytona was far away from being a top seller due to it's manual winding Valjoux 72 caliber and screw-in crown. While the Quartz watches were being highly praised with their precise time keeping and user friendly features, Daytona on the other hand needs to be manually wound almost every day. With a screw-lock crown it was not a pleasant feature for most of the users at that time. Daytona has been demanded rarely and the samples have either waited at the stores or sold with high ratio discounts. 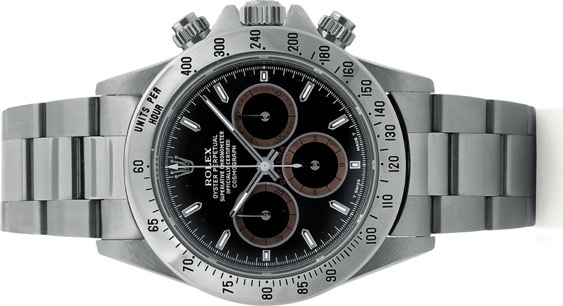 Finally, the first automatic movement Daytona was introduced in 1988 with a caliber based on the famous automatic chronograph movement Zenith 400. The Ref. Became 16520. 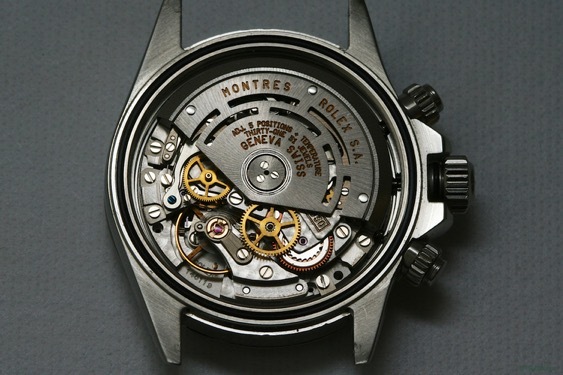 The movement supplied by Zenith was the best one around which could suit up with Rolex's high standard requirements. Of course Rolex went in to several modifications on the caliber. A new escapement was applied, a bigger balance with Breguet hair spring was added. It was an expensive mod but it was highly effective for improved accuracy. The beat rate reduced from 36000vph to 28800vph allowing the mechanism to be serviced with longer intervals. Date function was also cancelled. The new caliber powering up the Daytona had only half of the parts from the original Zenith 400. This new caliber named Ref.4030. Ref.16520 had some other major upgrades as well.The plexiglass crystal is replaced with a sapphire one and the case diameter was revised to 40mm from 37mm. The matt dial is replaced with a glossy one featuring luminova filled metal indexes and metal chapter rings around the sub dials. 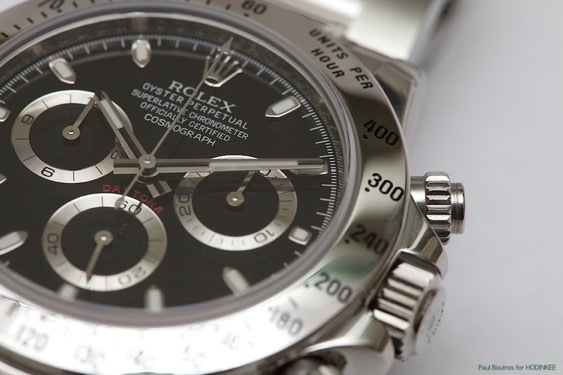 In 2000, Rolex launched it's new Daytona Ref.116520 featuring the all in-house automatic caliber Ref.4130. After a 5 year R&D period that new movement offered advanced robustness, superb accuracy and easy servicing. 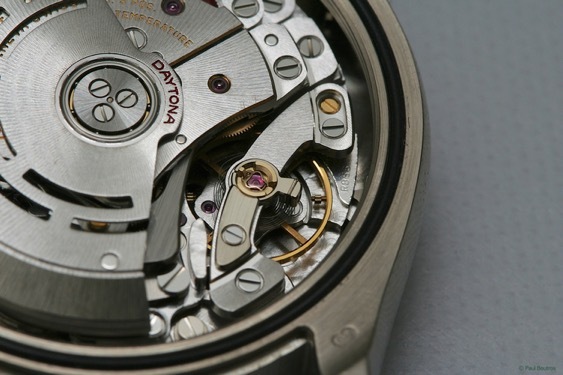 The most important feature of the in-house caliber 4130 was it's vertical clutch system. The chronograph function which operates independently from the main time keeping system, is powered by the hair spring through a clutch. Most designs with the horizontal clutch lay out offer easier production and servicing. However, that designs sports a pair of disadvantages; The first one is the reducing expansion rate of the hair spring upon press of the start button which effects the accuracy negatively. 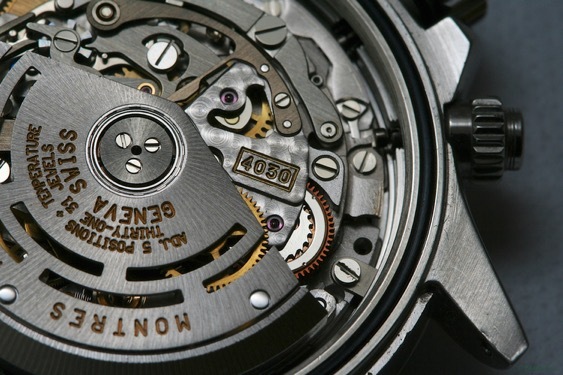 The second is the jumping chronograph second hand upon press of the start button happened due to the non matching resting position of the gears. Caliber Ref.4130 eliminated those problems with it's design. 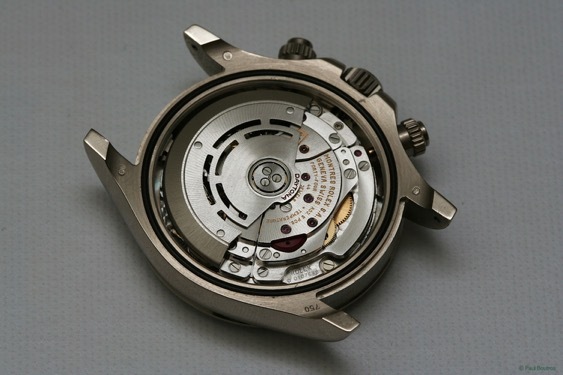 The use of the bigger hair spring offered 72h power reserve over the old version with 54h. The accuracy was also improved and better shock absorbing was achieved thanks to the balance double fixed with side plates. 4130 offered easier servicing compared to 4030. While 4030 featured a total number of 40 screws, 4130 had only 12. 4130 had 20% less parts than 4030. 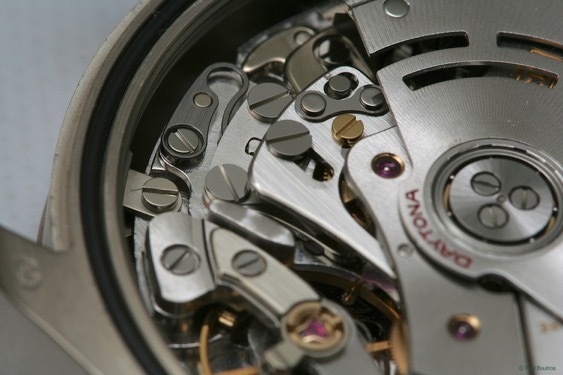 Rolex designed the vertical clutch system in a more advanced way allowing the mechanism to be re-oiled and replaced independently during servicing. 4130's hair spring could be replaced without touching the rest of the mechanism. The winding system was also working with 68% better efficiency when compared to the 4030. As most watch makers say Caliber Ref.4130 is a mile stone in precise watch making. 116520 also featured a different sub dial lay out. Additionally, wider indexes, longer lugs and mirror polishing on the sides were the other changes. ROLEX Daytona 116520 ( irrespectively of the dial color ) is still an iconic watch even it's been a long time since it's first introduction. Daytona's case is still not upgraded to a maxi form like the Submariner and GMT-Master did therefore it looks elegant and wears quite comfortable. 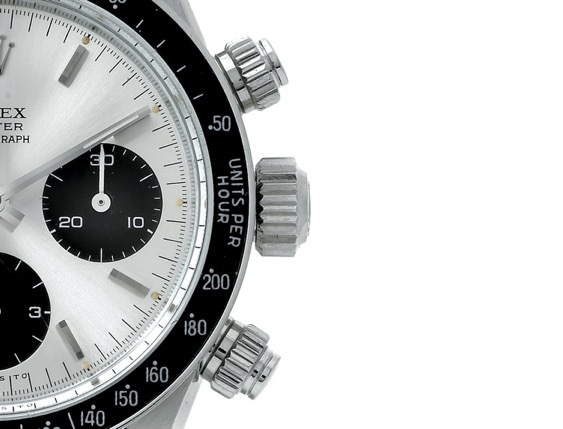 WR100M rating is more than enough for a sports chronograph. Daytona is dominated by mirror polished surfaces creating both pros and cons effects at the same time. Mirror polish makes the watch look like a precious jewelery on the wrist with a glamorous shine. On the other hand, the watch is very prone to scratches. As goes with the saying “ the first scratch hurts the most “. After a period of use, the number of the scratches increase and you start to notice them barely. In the meantime, slight polishing or a piece of Cape Cod may help the scratches disappear. It is not quite easy to tell how the watch wears on the wrist. Upon proper micro adjustment, Daytona feels like a silk scarf on the wrist. Rolex is extremely good at comfort. 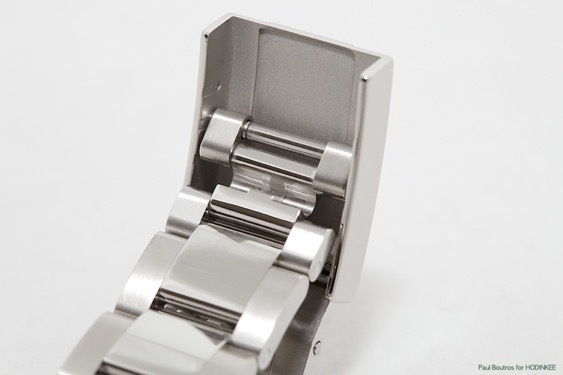 The Oyster bracelet features a folding clasp with micro adjustment. 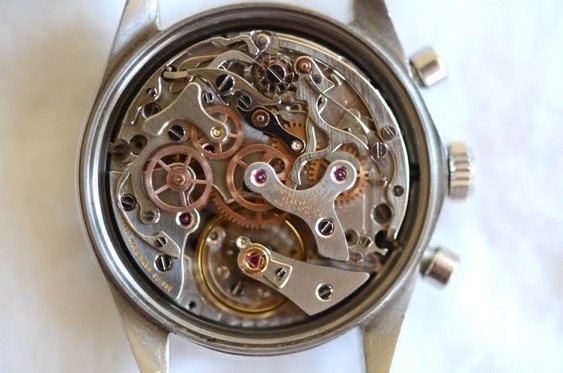 As mentioned before, the movement is the in-house caliber Ref.4130. It is quite hard to hear or feel the rotor move. 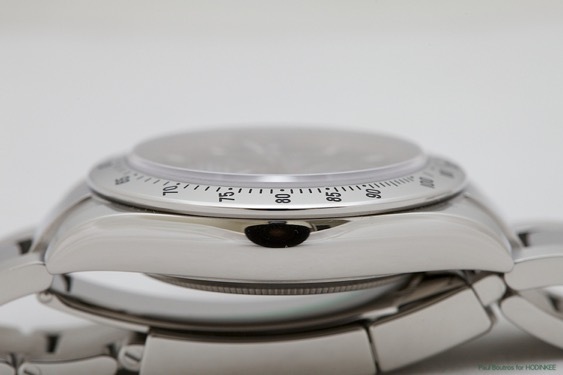 Chronograph pushers have a soft but solid feeling. The screw-in design of the pusher increase the WR rate but on the other hand slightly decrease the easy to operate ratio. Continuously working chronograph reduces the 72h power reserve slightly. The accuracy is +/- 2 seconds per day as expected from Rolex. The lack of the date display creates a perfectly balanced dial lay out. However, the absence of the date display may be a problem for the users who definitely need this function. 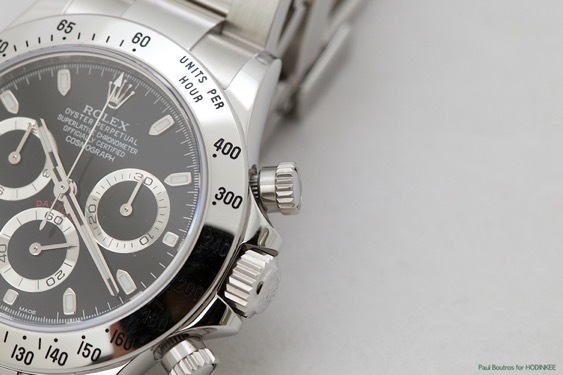 Rolex used Cerachrome bezels on the models 116515 and 116506. 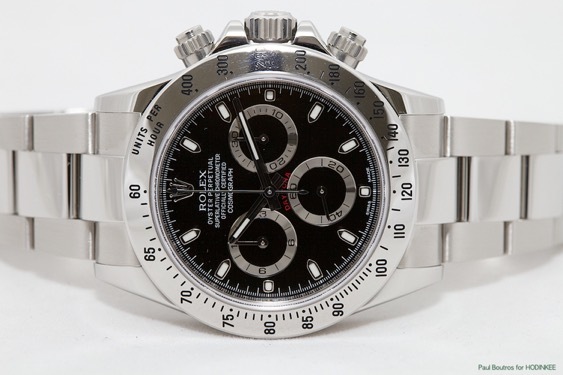 We are not sure whether this improvement will effect the stainless steel models or not however, I personally believe Rolex will produce a ceramic bezel stainless steel Daytona. When the subject is Rolex, it may take years for this upgrade to be effected. 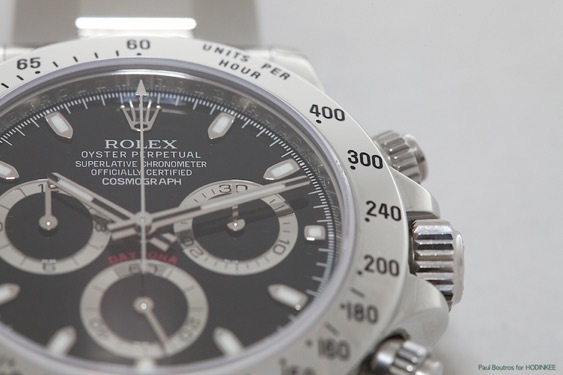 Rolex Daytona Ref.116520 is the most up to date version of a stunning model which is not a legend for only Rolex but for the entire history of horology. It should be considered as one of the best choices for anyone who is looking for a stainless steel sports chronograph.